(Phys.org) —The way in which male moths locate females flying hundreds of meters away has long been a mystery to scientists. 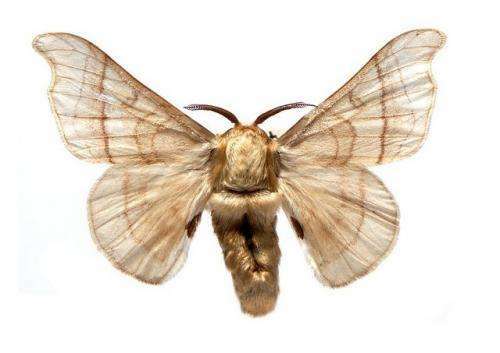 Researchers know the moths use pheromones to locate their mates. Yet when these chemical odors are widely dispersed in a windy, turbulent atmosphere, the insects still manage to fly in the right direction over hundreds of meters with only random puffs of their mates' pheromones spaced tens of seconds apart to guide them. "The male moths are flying toward females integrating all of this information along the way and somehow getting to them," said Massimo Vergassola, a professor of physics at UC San Diego. "French naturalists reported this behavior over a century ago and it has continued to be a puzzle to entomologists, neuroscientists and physicists." Vergassola and two other physicists from research institutes in France and Italy, however, now appear to have come up with a mathematical explanation for the moths' remarkable ability, which they describe in a paper published in the October issue of the journal Physical Review X titled "Odor Landscapes in Turbulent Environments." The three physicists developed a statistical approach to trace the evolution of trajectories of fluid parcels in a turbulent airflow, which then allowed them to come up with a generalized solution to determine the signal that animals sense while searching for food, mates and other things necessary for survival. "This a general problem—how animals, including ourselves, search for things," said Vergassola, the senior author of the paper, which includes Antonio Celani of ICTP in Italy and Emmanuel Villermaux of Marseille University in France . "A similar problem exists for flies that can detect garbage cans far away or for dogs that are guided by scents, although the difference is that their smells are generally on the ground, so their signals are much more stable. Insects face the most difficult problem as they rely on olfaction and detecting the volatile signals dispersed in the wind. When the atmosphere is turbulent, the signal becomes sporadic and simply disappears for long periods of time." The physicists solved this problem by first determining the intensity and duration of pheromone signals, then validated the results with numerical simulations, controlled lab experiments and field data. They found that pheromones emitted by female moths can be perceived by males located within a so-called "cone of detection" extending downstream as far as 1,000 meters away. They also found that pheromone signals are most commonly detected as intermittent "whiffs" that last only a few milliseconds, interspersed with periods below the insects' sensitivity threshold, which last from few milliseconds to tens of seconds. Vergassola, who was initially trained in statistical physics and now works at the intersection of biology and physics in a mathematical discipline called "quantitative biology," said the results could also be applied widely in agriculture or robotics. By controlling the behaviors of insects exposed to pheromones, he said, researchers could limit the ability of invasive or disease-carrying pests to mate. "It could also help engineers improve the design of sniffers, olfactory robots guided by chemical scents to search for bombs, toxic chemicals and flammable leaks," he added. "Leaks could be located this way because they release tiny volatile substances into the atmosphere that could be tracked by robots."